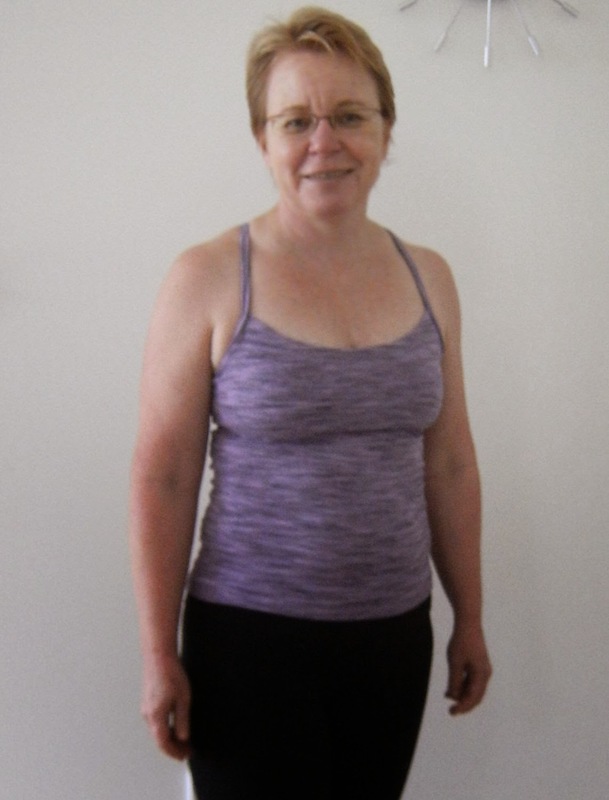 I have been participating in the active wear sewalong on Pattern Review. I have made a couple of tops and one pair of pants. I am finally getting some photos taken and will start reviewing what I have made so far. The first to get a successful photo is Kwik Sew 3115 View A top. The fabric is a TDF supplex bought from Runners Fabrics. It isn't cheap but you can get a couple of tops from 1 metre so not bad value. The main changes I made were to lengthen the pattern by 4 inches and cross the straps at the back. I did also cut the bra liner a little longer as a cheater fba. (one size up in length). 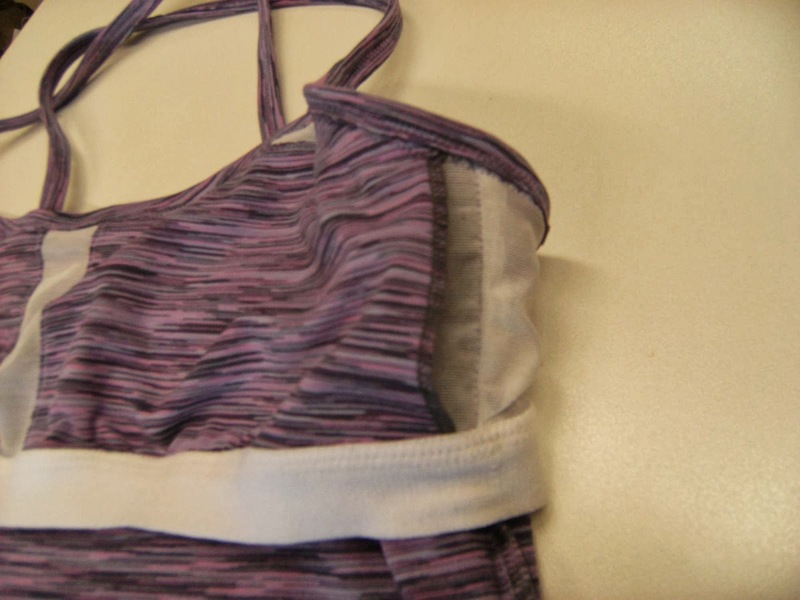 To make it more like my RTW gym tops, I sewed the built in bra (shelf bra) from powernet but added pockets in supplex to hold removable bra cups. I hope you can get a sense of how I did this from these photos. This is the top inside out. The powernet is white as is the elastic. I cut the supplex pockets from the bra front pattern piece, but trimmed it at the top and the sides. I sewed it to the powernet with a zigzag stitch (across the top and a few centimetres from the CF, then trimmed the middle part out. Probably not absolutely necessary but I was copying my RTW top. This is the back inside out. And this shot shows the pocket is formed as the side edge is overlocked shorter than the front bra piece and left open on the side. 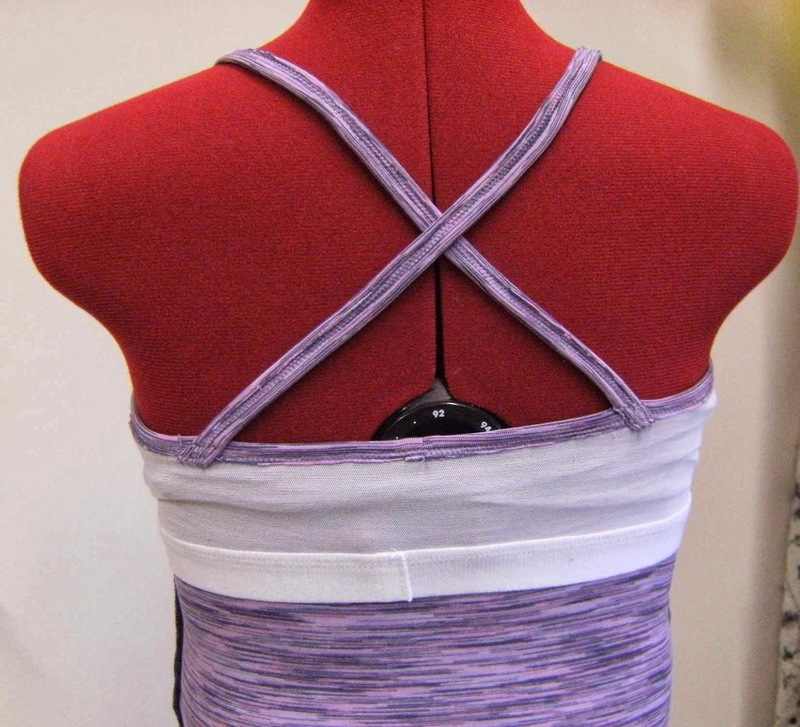 The only change I would make if I sewed another one, is to raise the front neckline a little as the top is very comfortable but I realised when wearing it to a yoga class that the top feels too low cut when adopting postures upside down like downward facing dog. Not a huge issue as no one is really going to be looking at your cleavage as they are all busy being upside down too, but for comfort I would prefer it to be a little higher (about an inch). Pretty happy with this pattern and I would recommend it. 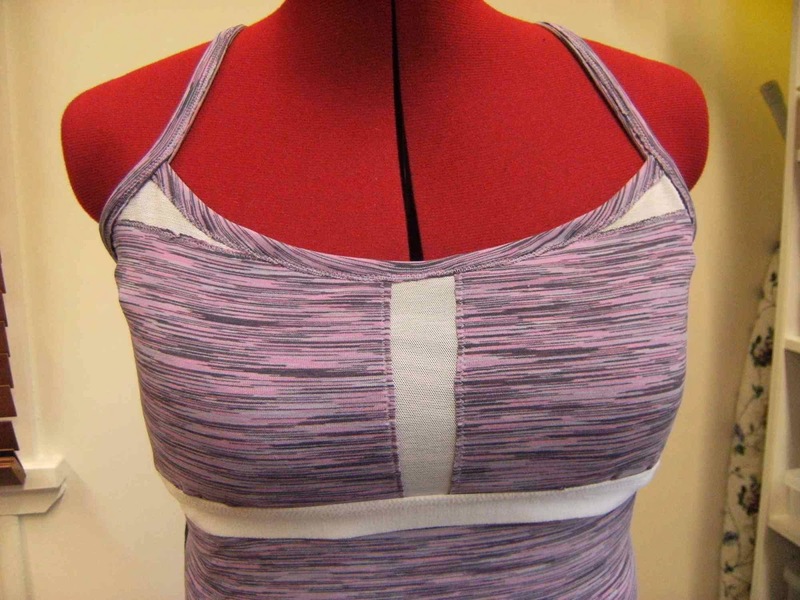 The built-in bra is fine for activities like yoga or weight-lifting but probably not enough support for cardio or running. Ciao kittens, back soon with some more successful active wear. Thank you so much for this review Sue. I go to Iyengar yoga classes, so am always picky with my tops - not low cut, not too much ease (so it doesn't flop down when you do inversions), and long enough so the top doesn't rise up with all the twisting and bending. This looks like a great top to try out. Thanks also for the link to Runners Fabrics. Fantastic looking top and thank you so much for the detailed review! Yay Sue. You did it. Nice fabric choice and I hope you get lots of wear from this. Your top looks great, but what a pain that the bra didn't work for you. That would be half the appeal, I imagine. Have you let the pattern designer know? Maybe she's got some suggestions. After all, that's how the indies are differentiating themselves from the Big 4, apparently.